One of the world's greatest super-heroes, The Martian Manhunter is also a leading member of The Justice League of America, and a very close friend of Superman. The Martian Manhunter's true name is J'Onn J'Onzz (pronounced like Jones), and he is one of the last of the original green Martians. One day, J'Onzz was teleported to Earth by way of a transporter created by Professor Erdel, who was trying to create a communications device for use between the two worlds. Erdel died of the shock, and J'Onzz was stranded on our planet. Using his natural ability to turn invisible, the Martian gradually studied his new home, and fortuitously found himself observing John Jones, who was a detective in the Denver, Colorado area. When Jones was murdered, J'Onzz utilized his shape-changing power to assume the identity of John Jones. At this point mastering his knowledge of American culture, the alien avenger brought Jones's murderer to justice, and then permanently became John Jones, Police Detective. Because J'Onn J'Onzz has powers beyond those of mortal men, he immediately used them for good, and created the super-hero identity of The Martian Manhunter. 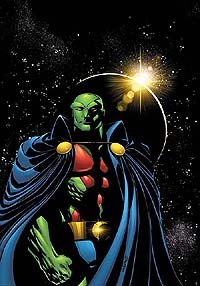 The Martian Manhunter is a founding member of The Justice League of America, and after a long hiatus, returned to Earth. Instantly resuming his place in the JLA, he and Superman have grown to be close friends, as the Manhunter has assisted The Man of Steel on several occasions. It was The Martian Manhunter who helped Superman defeat The Silver Banshee in her original confrontation with Superman. And more recently, The Martian Manhunter has assumed Superman's identity to eradicate suspicions that Superman and Clark Kent are one and the same. Like so many of his race, The Martian Manhunter possesses super strength, invisibility, telepathy, and the ability to fly. The one weakness of Martians is fire. As with a normal human being, fire is extremely deadly to The Martian Manhunter. It is not hard to understand the nature of their friendship. Besides being super heroes, the two adventurers share similar backgrounds. The Martian Manhunter was among the group of heroes kidnapped by Superboy-Prime and Alex Luthor during the "Infinite Crisis".